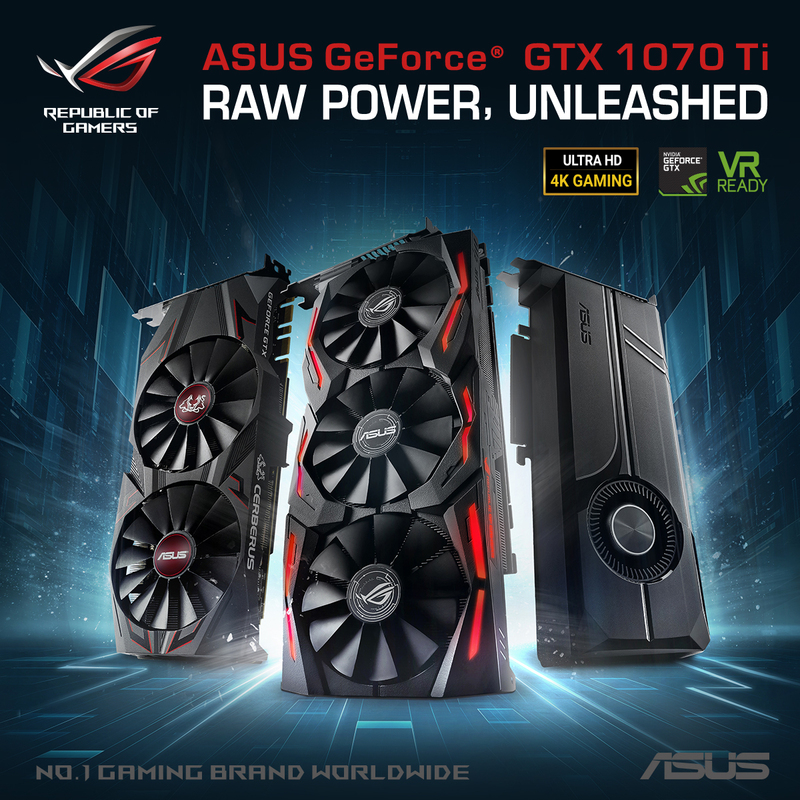 ASUS today announced the GeForce® GTX 1070 Ti Series, an all-new lineup of gaming graphics cards powered by the latest NVIDIA® GeForce GTX 1070 Ti GPU and engineered with ultrafast performance, advanced cooling, best reliability and personalized styling features to deliver exceptional experiences in all gaming scenarios. 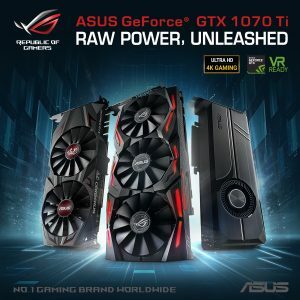 The new models include the high-performance ASUS Republic of Gamers (ROG) Strix GeForce GTX 1070 Ti Series with ASUS Aura Sync illumination for ultimate gaming power and personalization; ASUS Turbo GeForce GTX 1070 Ti Series featuring a dual-ball bearing fan for 2X-longer card lifespan and improved cooling efficiency; and ASUS Cerberus GeForce GTX 1070 Ti — a new, high-performance graphics card that’s engineered with the best compatibility and premium reliability for nonstop gaming action. 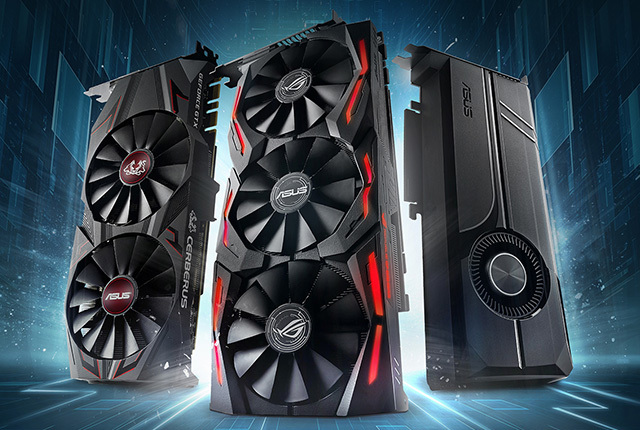 All ASUS graphics cards are produced using Auto-Extreme technology — an industry-first 100%-automated production process — and are built of premium Super Alloy Power II components that enhance efficiency, reduce power loss, decrease component buzzing under load, and lower thermal temperatures for unsurpassed quality and reliability. They also include GPU Tweak II for intuitive performance tweaking. With one click, the Gaming Booster function maximizes system performance by removing redundant processes and allocating all available resources automatically. An included one-year XSplit Gamecaster premium license lets gamers easily stream or record gameplay via a convenient, in-game overlay. The overlay also displays GPU clock speed, temperature, and VRM usage, and includes GPU Tweak II controls, so gamers can choose a gaming profile and boost performance with just one click. Strix GeForce GTX 1070 Ti is engineered with advanced cooling and reliability features to deliver ultrafast performance, plus Aura Sync illumination for the ultimate in PC personalization. Strix GeForce GTX 1070 Ti is available in two different configurations. Boosted clock speeds of 1721MHz in OC mode for the Standard Edition and 1759MHz for the Advanced Edition offer gamers great flexibility, as well as performance that’s up to 3.75% better than reference in full 4K UHD resolution in top games like Doom. Strix GeForce GTX 1070 Ti is equipped with MaxContact, an industry-first GPU-cooling technology featuring an enhanced copper heat-spreader that provides a 10X-flatter surface for up to 2X more contact area with the GPU versus traditional heat-spreaders, resulting in improved thermal transfer. The latest Strix GTX 1070 Ti graphics cards are constructed with a 2.5-slot width, providing 40% more heatsink surface area for heat dissipation compared to previous two-slot designs — delivering dramatically cooler and quieter performance. Strix GeForce GTX 1070 Ti features a patented 0dB wing-blade fan design, and three distinct fans, delivering maximized air flow and 105%-greater static pressure over the heatsink. The innovative 0dB technology stops the fan completely when the GPU temperature remains below a set level, for light gaming sessions in total silence. The fans are also IP5X-certified dust resistant for improved reliability. The card benefits from FanConnect II, a set of hybrid-controlled fan headers, and a comprehensive set of tuning options via GPU Tweak II to optimize system cooling even further. Strix GeForce GTX 1070 Ti includes ASUS Aura Sync RGB LED-synchronization technology that enables complete gaming system personalization. It also features a VR-friendly design with two HDMI ports, allowing gamers to keep a VR headset connected to their system for immersive, virtual-reality gaming. Turbo GeForce GTX 1070 Ti features a dual-ball bearing fan for up to 2X-longer card lifespan, and a customizable backlit logo to let gamers personalize their system. It also features a VR-friendly design with two HDMI ports. Cerberus GeForce GTX 1070 Ti is an all-new, high-performance graphics card that’s engineered with the best compatibility and premium reliability for nonstop gaming action. We test each and every card to the max, starting with extensive checks for compatibility with the very latest chart-topping game titles. We also carry out reliability trials that include a 144-hour diskless-system test and 3DMark benchmarking under heavy loading for 15X longer than industry standards. Whether playing for pleasure or creating commercial gaming environments for profit, Cerberus GeForce GTX 1070 Ti is the gaming graphics card that’s ensured to endure — and with all the power needed to deliver thrilling gaming experiences. One-year XSplit Gamecaster premium license valued at US$99.